Native tribes have used them for their supposedly powerful healing properties. Deep in the Peruvian Amazon lives a giant tree frog that is in high demand for its natural toxins, which people are using to poison themselves in a ceremony that has become the latest supercleanse trend. For hundreds of years, these frogs have been used by Amazonian tribes for their supposedly powerful healing properties. The person first burns a small area of skin and then applies the frog toxins, called kambo or sapo, to the burned spot so they’re quickly absorbed into the bloodstream. At first, the person feels a few moments of serenity, but within seconds, that feeling turns to suffering and can force the person to vomit. The effect shortly fades away, and practitioners say it’s worth it, claiming the process can cure depression, drug dependency, heart problems, high blood pressure and gastrointestinal issues. Lenny Kosh works as a mortgage broker and went to a kambo practitioner in the Los Angeles hills on a recommendation from his holistic health practitioner. Currently, there is no research indicating kambo benefits human health, and it is not officially classified as a medicine. There is no regulation of this treatment by the Food and Drug Administration or other authorities, though kambo is legal in the U.S., and people who use it swear by it. Watch the “Nightline” team’s harrowing journey deep into the Amazon rain forest to see the fabled frog up close and capture the kambo experience HERE. Amazon explorer Peter Gorman, who claims credit for bringing sapo to the U.S., owns a camp in the rain forest where visitors who want to try kambo can stay. As treatments from the Amazon like kambo become more popular, Gorman said, people can’t ignore the impact it could have on the local ecosystem. 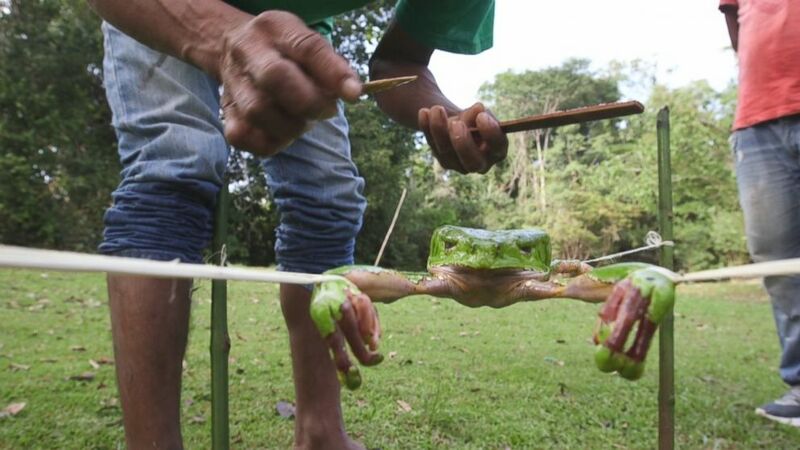 (ABC News) In order to extract the toxins from the frog, the guide places strings around each of its four feet and spreads the frog's body out between four sticks. (ABC News) The toxins are scraped off the frog's back with a stick. 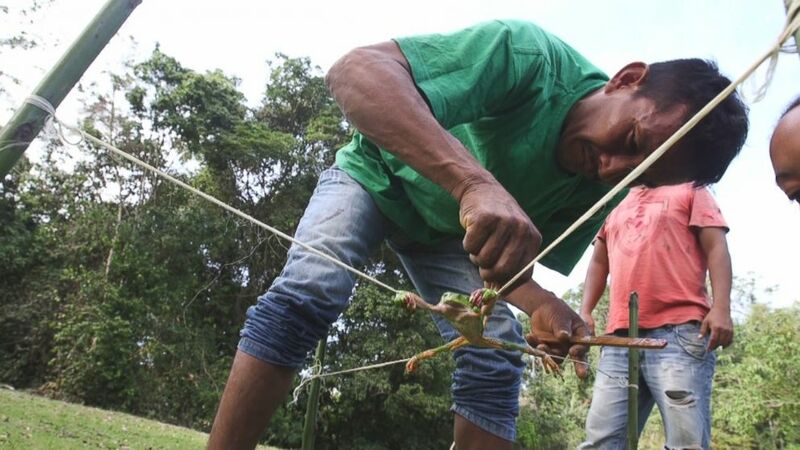 In order to extract the toxins from the frog, a guide places strings around its four feet and spreads out the limbs between four sticks. The toxins the frog releases as a defense mechanism are then scraped off its back with another stick. The frog is then released back into the wild. Once the toxins have dried on the stick, the skin is burned, and the toxins are reconstituted with saliva or water and applied to the burned skin. It takes about 15 seconds to feel the effects. Peter Arnold traveled all the way from Switzerland for kambo. He said he has tried it four times already because he wanted the “unique” experience. But afterward, participants say they feel cleansed.